The Jumeirah Mosque is one of the most photographed sights in Dubai. A fine example of modern Islamic architecture, this beautiful mosque is also one of the city's largest, with a majestic dome and twin minarets, and is one of the few mosques open to non-Muslims for tours. 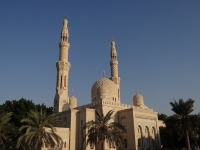 Non-Muslims may only enter the Jumeirah Mosque on an organised tour. Modest dress is preferred, however traditional attire can be borrowed from the Mosque. Opening times: Tours are on Thursday at 10am; tours are also available on Sundays at 10am in summer. Admission: Tour fee: AED 20 per person.